ENTER AGAIN THIS ENTIRE WEEKEND for another chance to win one of THREE $10 gift certificates to Restaurant.com! I'm switching it up for the weekend. Just leave as many comment entries as you want on this post (any comment) today, Saturday and Sunday (by Sunday, midnight PST) as well as a way for me to contact you. I'll pick 3 winners and post them on Monday. GOOD LUCK! I'll be doing more of this, so come back! One thing I'm finding while I blog browse is that people are thinking a lot more about being frugal this Christmas. I have to tell you that I'm refreshed by this. We (my hubby and I) have never been ones to go all crazy over Christmas gifts...I just don't feel like it's right. The season is not about presents, it's about the birth of our Savior. Growing up, we always had very simple Christmases. I never felt deprived. Several times, while visiting friends homes, I realized that some people go absolutely bonkers over Christmas. I had a childhood friend who received at least 40 (not exaggerating) gifts and then proceeded to complain that she didn't get three things on her list. Sad. I just don't like seeing people become materialistic monsters this time of year. I believe one of the good things that has come out of this country's recession is that people are going back to the simple way. People are focusing on spending TIME not money on their loved ones. I love that. Time. When money runs out, you can always earn more, but when time runs out...it's out for good. Spend time on your loved ones. 1. Read the Christmas story. 2. Turn up the Christmas music and dance with your kids. 3. Play in the snow or if you don't have snow, sled down a hill anyways! 4. Pray at dinner for the people you've sent Christmas cards to. Let the children say prayers for their friends. 5. Attend a Christmas pageant in your community. Most churches have them. Look one up and take your family. 6. Turn on your fireplace, pop popcorn in it and then have a slumber party! We used to do this when we were kids and it was a BLAST! 7. Help your kids string popcorn and then wrap it around the tree. 9. Drive around looking at Christmas lights. 10. Have a Christmas potluck! Invite friends over for a simple dinner and let them bring their favorite Christmas dish! 11. Make some Christmas decorations with your family. Here are some ideas from Family Fun. 14. Throw a simple White Elephant party. The gift can have a price limit ($5 or less) or something that is around the house. Here are the rules for a White Elephant party. 15. Instead of going nuts on the Christmas gifts, talk to your extended family and either agree to get gifts for the kids only or if that doesn't work, put a price limit on gifts. I've always thought that a Christmas drawing is great. Pick a name out of the hat and get that person a gift instead of the entire family...works great in large families. 17. Go through photos of your children with them. Let them pick out their favorite recent picture of themselves and then frame it for the grandparents, aunts/uncles, etc. Great frugal gift that they will love! 19. Find out where the locals are going. 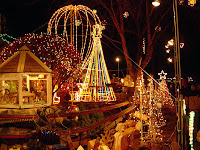 There are many public places that hold special events and Christmas festivals for free. 20. Go to a Christmas Eve service. Mix all ingredients well. Pour equal amounts of mixture into four 8"x3" or 9"x4" loaf pans. Cook for 45 minutes at 350. It will look a little brown when ready. Be sure to check center to make sure it's done. Let it cool. Sprinkle with powdered sugar. Variation: You can also "flour" the pan after it's been greased with cocoa powder or a cinnamon sugar mixture for a textured crust. This will eliminate that "white stuff" on the outside of your baked cake which makes for a prettier cake. I'm going to do a really fast peek at the FRIDAY SALE. It's late and I'm tired, but help yourself to more if you want to browse around...click here . OK these get the CUTEST little boots award!! Do you have a frugal tip for Christmas? Do share. :) Oh and remember...you can leave as many comment entries this weekend as you want for the giveaway! I don't have any frugal tips, I'm still learning. I guess shop around and compare prices - that's what I do. Thanks for the coffee press advertisement...I need to stop visiting here...no just kidding - I like your blog. Your blog always has great deals. I got the press...how could I pass it up for that price and with my hubby really wanting one?! I LOVE your frugal tips--just lovely. Around these parts, my sister-in-law and I share holiday cooking duties, so we each get a break entertaining the masses on at least one of the holidays. This is huge. Cuts down on expenses tremendously, and makes for a really warm, family-filled, loving affair. Shop online! Its cheaper, better deals. Bonus, you don't go to jail for murdering the idiots that go batshitcrazy in the malls. That will save you a lot of money. shop online!! google shopping and ebay. and i have definitely found that if you can make things and be creative, it's usually much appreciated!! Thanks for all your tips! Getting Starbucks and driving around looking at Christmas lights is one of my favorite things to do. Make gifts! Use your talents to create something from the heart! Instead of investing money, you're investing your time, and the effort means so much! I had a childhood friend also that bragged about all of her gifts. She would actually invite a bunch of us to her house to "showcase" everything that she got. We would just sit there, while she went through them one by one. She got at least 30 gifts probably. She always new for sure how many! I love your frugal tips - you have some really good ones listed! Thanks for doing the giveaway. How exciting! I am trying to just make things simpler this year. You have great ideas! We don't get snow ... last year on Christmas Day, I blew bubbles outside for our son! I save gift bags and reuse them. It's better for the environment than gift wrap, it's free, and it's fast. Our family also sets a gift amount limit. I like your frugal Christmas tips! Good ideas! Thanks for stopping by my blog! You were Olive? Very cool! So why did you give it up? I use recycled wrapping paper from last year! I also use recycled bows from last year! drink more water and less soda...and maybe less wine? Can't really think of any tips better than yours - great ones. We're in realy financial trouble currently, but we did buy for two angels on our church's tree. We're also going to downtown Dallas on Christmas morning to help out with Big Heart Ministry's. I wish those Buster Brown boots were in my size! I'm off to search the web now for some Rockin' pink snow boots! Eat out. Sort of. My family had a local restaurant cook the turkey, dressing, gravy, broccoli cheese casserole, dinner rolls, cranberry relish, and pies for Thanksgiving, and we are doing it again for Christmas. To serve 8 people (we only had 6, but we wanted leftovers), it was only around $5.00/person. We then added the rest of the usual suspects. Mashed potatoes, green bean casserole, noodles etc. (they sent fake mashed potatoes, but I froze them for later use, and made real ones). :) they're adorable and you can make them so nice with some tissue paper! write down gift ideas for each persopn on your list and you will save time. focus on the love you give to your family and that is what they will remeber the most. I think I commented enough...Merry Christmas Melody and family. Hope you guys have a great one!!! Hahaha I put "hope" you have a good one!! Catch the day after Thanksgiving sales and the day after Christmas sales! I saw someone in the grocery store yesterday who had a "RAIN CHECK" for a sale that she tried to come get and they were out everytime she tried, so they gave her a rain check! Never knew you could do that! Pretty cool! Find blogs with tips! There are tons!! 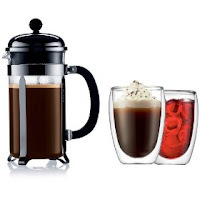 Looks like I will be getting my coffee press sometime this week! Woo hoo! I really love your posts.Because aside from your products, you also include some delicious ingredients for free and in this post the frugal tips to spend christmas. I will definitely do the story telling about the birth of christ. The kids will surely learn something from it and will surely enjoy it. Oh I was just thinking about some more frugal ideas... and I think that baking treats and packaging them cute is always a nice, little, inexpensive way to spread the cheer! We did the kids only thing this year as well. Seeing how my brother and sil keep having kiddos (working on #4) we're going to have to keep this tradition going!! Frugal tip: this is actually from a very good friend of mine, but I'm sure she would be pleased to see it passed around. Maybe? She's giving her husband a gift certificate to "Lingerie of the Month." Stick with me - she's wrapping up all of her "honeymoon apparel," plus a couple new fun things, 12 small gifts, for him to keep and open once a month. Obviously not on Christmas morning with the kiddos around, but I thought it was brilliant, and a fun way to add a little zing to your marriage. Yes exactly, in some moments I can phrase that I jibe consent to with you, but you may be in the light of other options. to the article there is still a without question as you did in the downgrade delivery of this beg www.google.com/ie?as_q=lyrics end of the world armor for sleep ?